SEOUL, SOUTH KOREA – Soon after my wife, Hyeyoung Lee, and I began our mission co-worker assignment in South Korea, a Presbyterian elder from Cayuga-Syracuse Presbytery, Linda Russell, called to tell us that her presbytery has been maintaining a Korean Partnership Team for over a decade. Linda suggested this team might be interested in our work as site coordinators of the Presbyterian Church (U.S.A.)’s Young Adult Volunteer (YAV) program. We felt our excitement for the work ahead reciprocated. That began what has been a long and fruitful partnership with Cayuga-Syracuse Presbytery. One member of the presbytery’s Korean Partnership Team, the Rev. Earl Arnold, learned about our work through our blog. He read about a study trip we led with our YAVs to the Jeju 4.3 Peace Park, where, on April 3, 1948, as many as 30,000 people were massacred. Our blog post inspired Rev. Arnold to research other Korean massacres linked to the U.S. military. 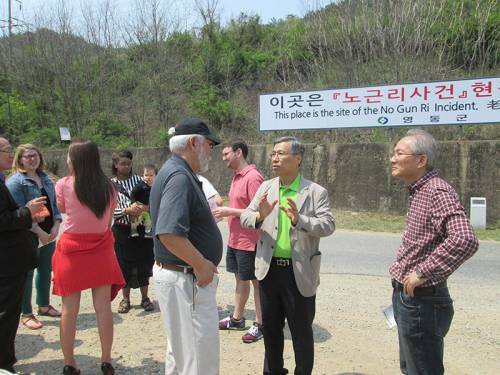 He found the story of No Gun Ri and noticed that the No Gun Ri Peace Park is very near our home in Daejeon, South Korea. Rev. Arnold made plans to visit us, and he asked if we could visit the No Gun Ri Peace Park together. The No Gun Ri Peace Park, 100 miles southeast of Seoul, is a visible reminder of a massacre in which about 300 people died in the early days of the Korean War. At that time confusion led U.S. soldiers to fire on villagers fleeing southward, trapping them under a bridge for three days and four nights. This left village survivors wondering why they had to endure such an assault. Hyeyoung and I were deeply moved by the director of the peace park, whose mother was injured under the bridge. His vision for healing includes bringing together soldiers present at the incident and surviving families, so that the soldiers and U.S. government can take full responsibility, and by doing so, both soldiers and villagers can begin to heal. We are partnering with the director of the peace park and continually looking for ways to share this story with Presbyterians in the U.S. Rev. Arnold and others from Cayuga-Syracuse Presbytery also felt moved by the director’s mother’s experience. They wrote an overture, which was approved by the PC(USA)’s 222nd General Assembly (2016). The overture expressed apology on behalf of U.S. Presbyterians for the actions of our government and military, and also pledged to urge the U.S. government to issue a full apology. This overture helped to focus peace efforts through various conversations, which indirectly led to the creation of the Presbyterian Peace Network for Korea (peacenetworkforkorea@gmail.com). A PC(USA) peace delegation, led by the Rev. Dr. J. Herbert Nelson, II, Stated Clerk of the General Assembly of the PC(USA), the Rev. Arnold and the Rev. Edwin Kang from Cayuga-Syracuse Presbytery, traveled to South Korea in November 2017. Delegates visited with World Mission partners in South Korea and held a service of healing with No Gun Ri survivors and their families. Kurt Esslinger and his wife, Hyeyoung Lee, serve as site coordinators for the PC(USA)’s Young Adult Volunteer program in South Korea. Kurt works with the Reconciliation and Unification Department of the National Council of Churches in Korea. Hyeyoung works with Hannam University’s Global Multicultural Leadership Program. This article originally appeared in the Summer 2018 issue of Mission Crossroads magazine, which is printed and mailed free to subscribers’ homes within the U.S. three times a year by Presbyterian World Mission. To subscribe visit pcusa.org/missioncrossroads.